August 10, 2018. Bengaluru, India – Leaving Goa yesterday morning, His Holiness the Dalai Lama took a short flight to Bengaluru. He drove into the city and was welcomed at his hotel by a large contingent of Tibetans who live in Karnataka. Tashi Shölpa and Gyal Shay dancers performed on the hotel forecourt, while a young man and woman in Tibetan costume offered the traditional ‘chemar changpu’. Ganden Tri Rinpoche, followed by other hierarchs, formally greeted His Holiness. Abbots of the various monasteries in the Tibetan settlements lined the lobby to the lifts. His Holiness reached his room in time for lunch. This morning, before going out, His Holiness gave an interview to Shoba Narayan, a journalist, author and Bangalorean. She began by asking him what he had learned about aging well and he told her that this would vary from one individual to another. In his case, he trained in the Nalanda Tradition, with its thorough use of reason and logic. Although, as a child, he was reluctant to study, as time went on he began to appreciate the value of what he had learned. Asked if this would be different for men and women, His Holiness was quite clear that training the mind involves mental consciousness and on that level there is no difference between genders. We can learn to focus the mind so that it does not run after distractions and then use it to analyse the difference between the appearance of things and their deeper reality, and the disadvantages of giving in to destructive emotions like anger and jealousy. When Narayan asked His Holiness about whether he ever felt sad and what he did about it, he remarked that earlier in the morning he had been watching young people exercising from his window and reflected that he can’t do that anymore. She asked if he had any regrets and he told her that when he looks back on his life he feels satisfied that decisions he took at crucial junctures were correct. Narayan went on to ask His Holiness about making hard decisions, fear, establishing harmony in the world and his favourite food. In answer to the last he remarked that followers of the Buddha eat whatever they are given. The Buddha, he clarified, belonged to no fixed institution and had no kitchen, not even any shoes, only an alms bowl and his robes. His Holiness drove to the West End Hotel where a ‘Thank You Karnataka’ event was being held as part of the Central Tibetan Administration’s (CTA) year of gratitude to India in Tibetans’ 60th year of exile. He came out to receive the Chief Guest, Karnataka Chief Minister, HD Kumaraswamy and they walked together to the hall. Everybody stood for Indian and Tibetan national anthems. Local Chief Representative of the Tibetan community, Chophel Thupten welcomed His Holiness, the Chief Minister, Prof S Nijalingappa, CTA President Dr Lobsang Sangay, Speaker, Khenpo Sonam Tenphel and everyone else present. He noted the centuries old connections between India and Tibet, remarking that Buddhism has become part of the Tibetan identity. He recalled that what was first configured in 1956 as Mysore State became Karnataka in 1973 and celebrated the support Tibetans have received from the people and government of the state. Khenpo Sonam Tenphel, speaking in Tibetan, mentioned that India and Tibet have maintained close relations for more than 1000 years. He quoted former Indian Prime Minister Moraji Desai as saying that India and Tibet are two branches of one bodhi tree. Dr Lobsang Sangay spoke in English, “As His Holiness has advised, we keep our old friends and make new ones. We remember and are grateful to everyone who has offered us help. This year, the CTA is saying ‘thank you’ to India and beautiful Karnataka for the kindness and generosity you have shown us. Chief Minister HD Kumaraswamy has extended facilities to Tibetans equal to those available to the people of Karnataka. This state has the largest Tibetan population in India, the largest number of Tibetan monks and nuns and the largest number of Tibetan schools. Dr Sangay made the audience laugh with a story of a Tibetan in Canada pulled over for a traffic offence, only to discover that the policeman came originally from Karnataka. As they enjoyed exchanging experiences in Kannada (the language of Karnataka), all thoughts of the traffic ticket were forgotten. As a token of gratitude to his family, His Holiness presented a Dharma Wheel to Prof S Nijalingappa, youngest son of former Chief Minister Nijalingappa who was the first friend of Tibetans in the state. Tenzin Choeden sang a song in Kannada. Chief Minister HD Kumaraswamy told the gathering that it was a privilege and an honour to be present in His Holiness’s company. He recalled that Nijalingappa had offered Tibetans land on which they had established five settlements. He acknowledged the contribution Tibetans had made to Karnataka and wished them well. There followed a dance representing the people of the three provinces of Tibet. 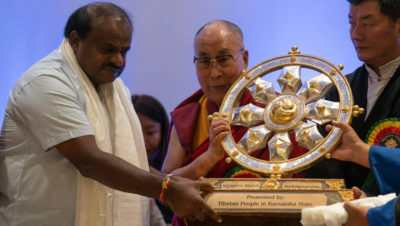 His Holiness presented a Dharma Wheel to the Chief Minister in gratitude to the Karnatakan public, as well as offering gifts to the MLAs of the districts that include Tibetan settlements. His Holiness then began his address by greeting his respected brothers and sisters. “It’s a great honour for me to have the opportunity to thank the state of Karnataka and its people for their friendship and support. We Tibetans will never forget your kindness. We faced problems in Tibet from 1956 onwards when the Chinese authorities imposed the same reforms on us that they had implemented in mainland China. These reforms were unsuitable for Tibet and Tibetans resisted. By 1959 there was oppression all over the country, which provoked further opposition. “In 1954, I went to China and met Chairman Mao several times. I was attracted by what I learned about socialism. As I returned home in 1955 I met General Zhang Guohua and told him that when I set out the previous year I was apprehensive, but I was returning full of confidence. However, from 1956 onwards things turned out differently. ‘When we reached India in 1959, Pandit Nehru gave me crucial advice that if we wished to keep the Tibetan issue alive, we needed to educate our children. To do that, and to preserve the Tibetan language, we would need separate schools. He set about helping us establish them. He also supported our wish to set up Tibetan settlements and wrote to the various states asking if any could provide the necessary land. Nijalingappa, who I had first met when I came to India in 1956, offered the most generous response. “The cultural heritage we kept alive in Tibet originally came from India. In 7th century the Tibetan Emperor initiated the creation of a Tibetan written language, based on the Devanagari alphabet and Sanskrit grammar. In 8th century, the Emperor invited top scholars of Nalanda University to come and establish Buddhism in Tibet. From that time on we have kept the Nalanda Tradition alive. Today, the knowledge it contains remains relevant. “Today, when the world is facing an emotional crisis, the solution is not to be found in prayer alone, but in training the mind, learning to reduce our destructive emotions and strengthen those emotions that are positive. It’s in this context that I have committed myself to trying to revive appreciation of ancient Indian knowledge in India. I believe India is the only country that can combine ancient psychology and understanding of the mind with modern education. “When we first arrived as refugees, we were demoralized, but 60 years later we have rebuilt our confidence and have come to see how we may contribute to the wider benefit. This is due to the support of the Government of India, which has its origins in the kindness of Pandit Nehru. Jigme Tsultrim offered words of thanks to all who had contributed to making today’s event a success, as well as to the many individuals and organizations that have shown Tibetans friendship over the years.